Yesterday we mentioned that more hotel programs have come out with their 2016 hotel category changes. Now these aren't the addition of new categories rather the free award night category that hotels fall in. We do see these changes every year and most are predominantly worse however this year for those of you travelling and redeeming within our borders things have gotten better. We've already detailed IHG Rewards Club's and Marriott Rewards' changes and now here are Starwood Preferred Guest's. "Just over 20% of hotels are changing category; of these, 12% are moving up and 8% are moving down including some favorites such as The St. Regis Bangkok, Thailand & Le Meridien Bora Bora." The good news for those of you redeeming for stays in Canada is that we see many hotels go down by one category while only one went up by one. 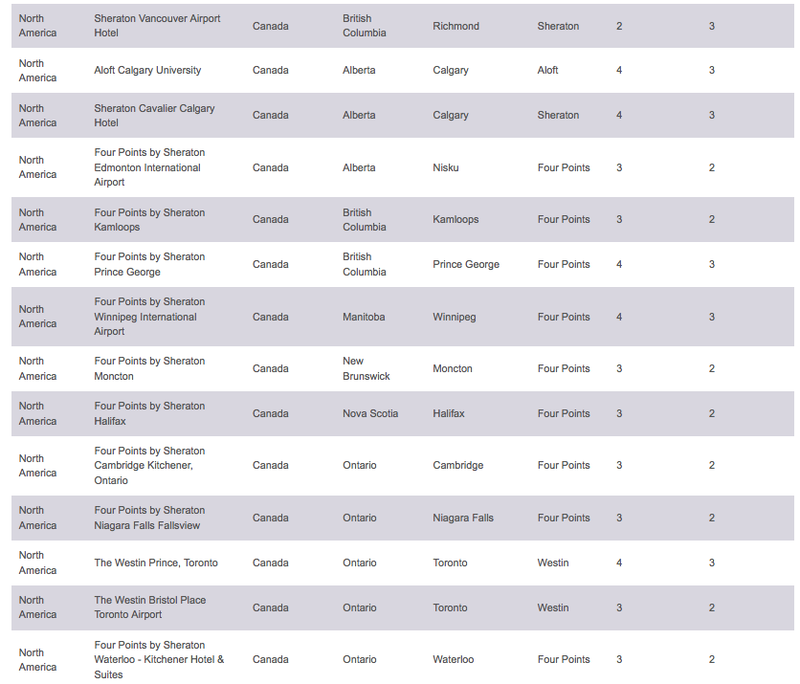 That means 13 hotels go down a category with the majority of them being in Ontario and Alberta. So what does this mean for Starwood Preferred members? Well take a look at the complete list of hotel changes here to see if any hotels you have currently booked with points or are planning to book with points to see if they are moving up or down. If the location(s) are moving up then you'll want to lock in your booking before March 1st when these changes take place as you'll still be able to redeem at the current 2015 rates. However if one or more of planned redemptions is at a location moving down a category you'll want to hold off until March 1st to book to ensure you use less points for that redemption. Already booked for a stay after March 1st? Once that day comes check to see if the hotel has award nights available at the lower rate, book it and then cancel your old award reservation. The great news for Canadian redemptions and all the hotel changes that go down a category means that you can make more of the 20,000 points received from the The Starwood Preferred Guest®* Credit Card from American Express. Especially those hotels going from Cat 3 to 2 as you move from 2 nights with leftover points to 5 free nights! Of course on the flipside you have quite a few hotels (160+ Worldwide) that will cost you more points! One huge change of note sees the Four Points Penghu in Taiwan move from Category 1 to 5. Ouch!! • New Starwood Preferred Guest®* Credit Card from American Express Cardmembers, earn 20,000 bonus Starpoints® after you charge $500 in purchases to your Card in your first three months of Cardmembership. • American Express is not responsible for maintaining or monitoring the accuracy of information on this website. For full details and current product information click the Apply now link.